"Happiness is a way of travel but not a destination" could be the motto for this newsletter as travel is certainly in the frontline and no destination in sight until the end of November! We could call it a busy year with lots of news but little time to talk about it! However, it has been a great season so far with many lovely guests and wonderful experiences together. 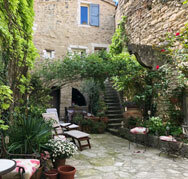 There was spring in the air in Provence and our courtyard was ablaze with roses and the sweet-smelling scent of Jasmine. 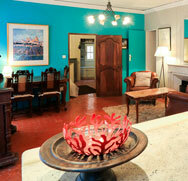 Our guests certainly enjoyed the fresh changes we made to our apartments and the rental season had a very good start. Eleonore and Sancie apartments shine brightly now with more modern colours without losing any charm of their original glamour. Our guests can never believe how quiet our apartments are even though they are only a matter of minutes from the centre of town. We hope you enjoy the short video, which might tempt you to join us in our lovely village very soon. Forcalquier is almost in the heart of Provence and all major points of interest can be easily visited in a day. 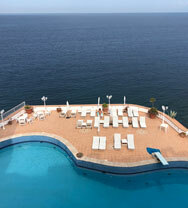 Travelling time to nearby cities - Nice 2½ hours, Aix-en-Provence 1 hour, Avignon, Marseille and French Alps 1½ hours. Please remember that we can help you arrange yoga, golf, art, language and cooking classes during your stay with us in Forcalquier. 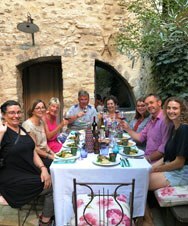 You may not get a better connection with Forcalquier than staying with The Clarke Family. 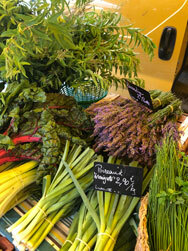 Graeme is a local expert, and wonderful human, with so much to offer not just in Forcalquier but all of Provence. Graeme helped us decide on what adventures to go on in a day from driving through the Gorge, to seeing other local villages, to his favorite croissant. What an absolute pleasure. The apartment is beautiful and peaceful. It is nice and dark at night which helps with jet lag, and very quiet. I couldn't have asked for a better spot in one of my favourite towns on the globe. I travel with my female partner, and that was very welcome with The Clarke Family. Traveling as a gay couple is not always easy, but we felt at ease and loved with open arms. All in all, you will not be disappointed. Thank you Clarke Family!" 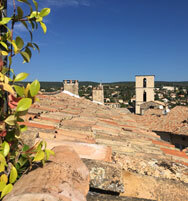 After three years of silence to allow the restoration, the work on our new carillon has been completed and returned to the inhabitants of Forcalquier with 19 more bells, so 37 in total. The installation of the new keyboard, all the mechanics and the last adjustments were finished on the 18th of March. 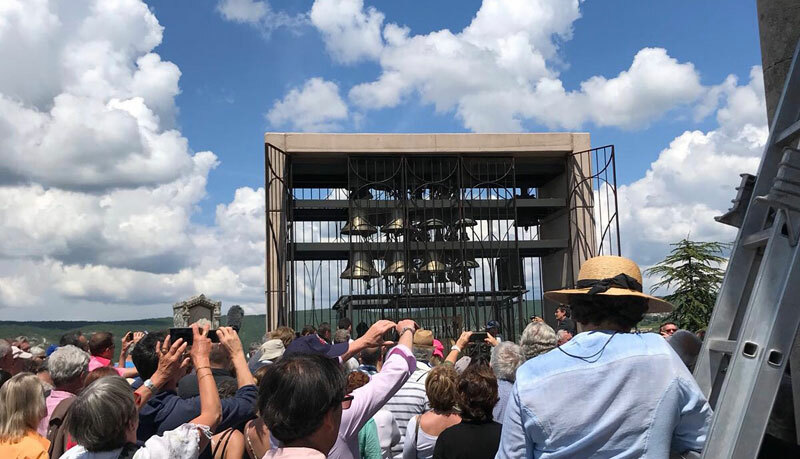 The 37 bells at the top of the Citadelle of Forcalquier occupy a special place and now in the new building, all visitors can view the "carillonneur" playing. The carillon of Forcalquier is one of the rare hand chimes of Provence and this gives it its very unique sound. It is practicing the traditional style "with punches", which is so interesting and now the new glassed in Carillon allows observers to view this unique process. 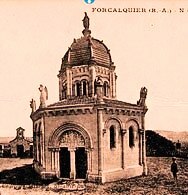 Created in 1925 the first carillon of Forcalquier was installed in a dilapidated building, which was destroyed, and a new building succeeded it, thanks to the association "Renouveau Campanaire Provençal" and many volunteers. 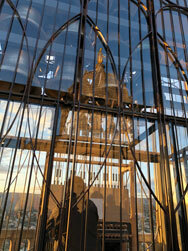 The carillon itself was remodeled in order to maintain an age-old musical tradition. A unique instrument in the world consisting of 37 bells, weighing from 10 to 150 kilos! 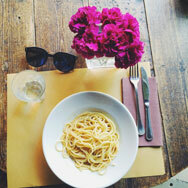 For most of Spring Gabriela and Francesco spent their time in Southern Italy. On the La Dolce Vita walk they had brilliant weather and this year it was finally possible to take a group all the way up to the summit of Mount Etna, which for once remained astonishingly well behaved. It was wonderful. I have previously been on at least 6 Walkabout adventures and loved all of them. But in several ways, this was probably the best. As usual all the accommodations were just the family run ones you would want to stay in but rarely find for yourself. Also, as usual the meals were excellent and provided a wide experience of Sicilian food. Sicily is a fascinating island with seemingly endless layers of history and architecture due to numerous invasions over many centuries... We walked around mountains covered with the brightest Alpine coloured flowers I've ever seen. The views were also magnificent. From Lipari we were able to go in boats to see Volcano and climb near to the Stromboli volcano. Every walk introduced us to different aspects of Sicily and we were able to visit Roman arenas and a large Greek theatre. On our last day we visited Hadrian's Villa with extraordinary mosaics. For me the most unexpected experience was climbing up Etna while it was gently spurting out steam, sulfur and dust. Amazing. I came away fitter, amazed by the variation of the countryside and much more aware of the history. The perfect way to spend a holiday with people with similar interests." 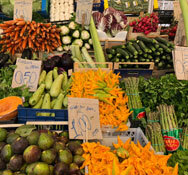 They then travelled from Palermo to Naples where they continued with the Epicurean Walk in Italy. In 2019 it will once again start in Sorrento but the last 2 nights will be spent near Amalfi, a better base for the "Walk of the Gods" and then the walk to Ravello. Both were happy to return to Norcia, which is Francesco's hometown. 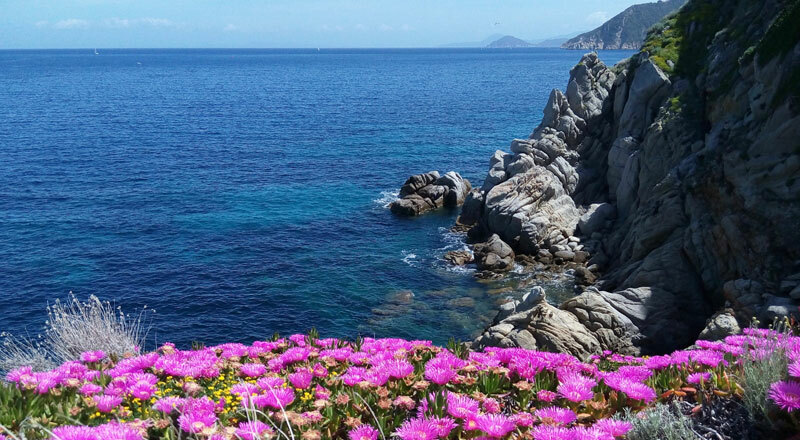 After the earthquake and closure of the road, this year they were able to walk again in the Piano Grande in the Sibilini National Park, which was ablaze with beautiful flowers. 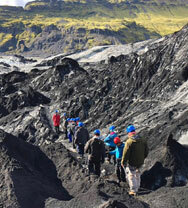 We were highly satisfied with the way the tour was conducted and the cosy size of the group! The travelling was long across Italy but don't know how that could be changed. We were very happy with the diverse itinerary and the way our wonderful guides looked after us in every way attending to all our needs with professionalism, care and humour! 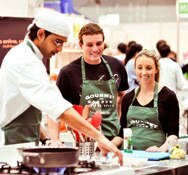 The hotels were of a very high standard and the gourmet food every night was a special highlight! Picnic lunches added a nice touch! It was a super adventure for us exceeding our expectations and we definitely want more! Our heartfelt thanks and appreciation to Gabriela and Francesco for the great job you did - we salute you!" 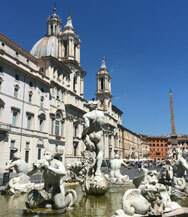 Nastassja has just completed her first city tour in her beloved Rome and it was a great success! 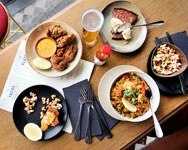 It is a perfect way to immerse our guests in the Roman food scene and uncover the city's secret corners while intermingling with the locals. 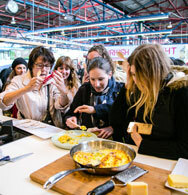 Get prepared to learn how to cook like a true Italian in the kitchen of a Roman family, gain a deeper knowledge about the ancient city's churches and fabulous art collections. 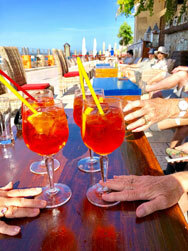 And last but not least, truly indulge in the "aperitivo" scenic settings and let every evening be pure entertainment and also a unique experience for the taste buds! Thank you for a marvelous holiday. It could not have gone better, Nastassja looked after me very well, did the sights and galleries. The tour guides were very professional and obliging. I was privileged to be part of a small private group, only me!! The restaurants and market/cooking were especially good. I will recommend to anyone!" In July our countryside in Provence was once again dominated by the lavender with its exceptional colour and scent. Our Flavours of Provence tour came at the right time of year to admire this picture-perfect landscape of lavender fields. 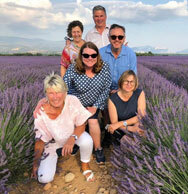 The theme was certainly lavender, orientated in every aspect from walking through lavender fields to distillation and cooking we learned so much more about this fascinating plant. We also acquired a deeper understanding about wine thanks to a wine judge who was also a member of our small group. At the end we had not only a cooking but also an additional wine seminar and all parted enriched with so many new experiences. 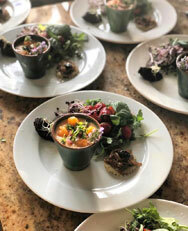 A highlight was super chef Virginie Besançon who took part in our two days of cooking and shared many of her wonderful recipes. Joining the bakers of the Biscuiterie in Forcalquier was also a morning of fun making biscuits in all shapes and flavours. This time guests stayed in our own apartments where we spoilt them every morning with a delicious and healthy surprise breakfast. We also offered yoga in our new yoga studio, which was very popular with all guests. The best discovery this summer was the Bistrot de Lagarde, high up in the mountains and in the "middle of nowhere", where the dining is of the finest - before the meal even begins the "mise en bouche" is a "taste explosion" in the mouth! Please contact us for further details and prices. A truly wonderful 'holiday' in the true sense of the word. Based in one place, the beautiful Charembeau Hotel, with its beautiful gardens and character rooms, it was the best smelling place we have been in, impregnated with the aroma of lavender and honey. We loved the small group size and ate in charming small local restaurants which would not be accessible to a large group. 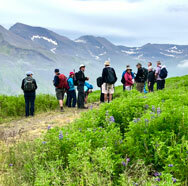 The tour was was conducted at a relaxed pace and we visited many interesting and beautiful places. Travelling with Graeme was like having a friend showing you around, even to the extent of being taken to his wonderful character home. The bus/van was more than adequate for our small group. Cooking schools were held in a charming provincial kitchen and we learned many different and interesting techniques and recipes. Eating on the terrace, the meal we had cooked, was most enjoyable. 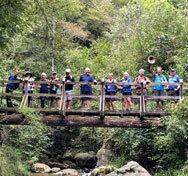 We would certainly recommend this tour and Walkabout Tours to anyone. We loved it!" Green & Blue, Black & White are the true colours of Iceland and Gabriela was happy to leave the European hot summer behind to return to one of her favourite countries. Supported by Callum, who is new in our guide team, they returned to Siglufjörður, which remains one of those special places in their hearts! Also, this year Gestur and Snæver, two of our local guides, proudly showed off their countryside. 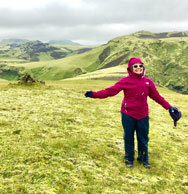 Exciting Myvatn Lakes was fantastic and our walks with Bergþóra were exciting and saw us discovering new grounds. Perhaps next year we will plan a visit to meet Bergþóra's huskies in a magnificent setting. Gabriela and Callum visited her one evening and learned so much about this amazing breed of dogs. 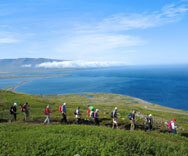 Both were happy to return to the ever so dreamy Seydisfjodur in the Eastern Fjords with our charming guide Ola Maja. This is a place filled with troll and elf stories and our waterfall walk is one of the many highlights of this tour. The changes on the south coast were very well worth it and we are now staying in Kirkjubæjarklaustur, which literally translates as 'church farm cloister', but the local people usually refer to it just as 'Klaustur' as it is so much easier to remember this way! It is a small village in South Iceland, half way between the two main attractions on the south coast: the beautiful black sandy beach at Vík and the famous Jökulsarlón Glacier Lagoon with its fabulous Diamond Beach. Until recently, the South East Coast was mainly uninhabited, apart from a few farms and summerhouses. Kirkjubæjarklaustur is part of the beautiful Katla Geopark and it is the gateway to Iceland's largest National Park, the Vatnajökull National Park. The surrounding landscapes have a similar volcanic character since the whole area has been shaped by series of volcanic eruptions; the Laki eruption in 1783-1784 was the largest of them all. Five cubic kilometres of lava flowed to the surface, leaving a 565-square-kilometre lava field, which surrounds Kirkjubæjarklaustur in every direction. Today the lava has long since solidified and a thick, soft layer of fragile moss now covers it. We are excited about our new walk through these Pseudo Craters of Eldhraun, which ends at the magnificent Fjaðrárgljúfur canyon, 100m deep and 2km long. 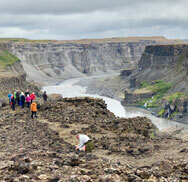 It has incredibly eye-catching fluvial terraces on both sides of the canyon. Unfortunately, we missed out again to visit Lakagígar or the Laki Craters, a 27km long fissure with 130 volcanic craters in the Highlands… but there is always next year. 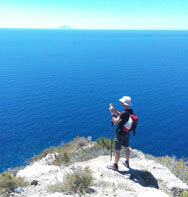 Raggi is our irreplaceable guide on the south coast and was very helpful with finding some of our new walking tracks. We finished at the Ion Adventure Hotel and with an incredibly colourful hike through the Hengill Geothermal area at Nesjavelli. Bergþóra's sledge ride with the huskies, the nature bath in winter and the Northern Lights are not the only reasons for a Winter Walking Tale in Iceland, which is in the making... stay tuned… it will be coming soon! 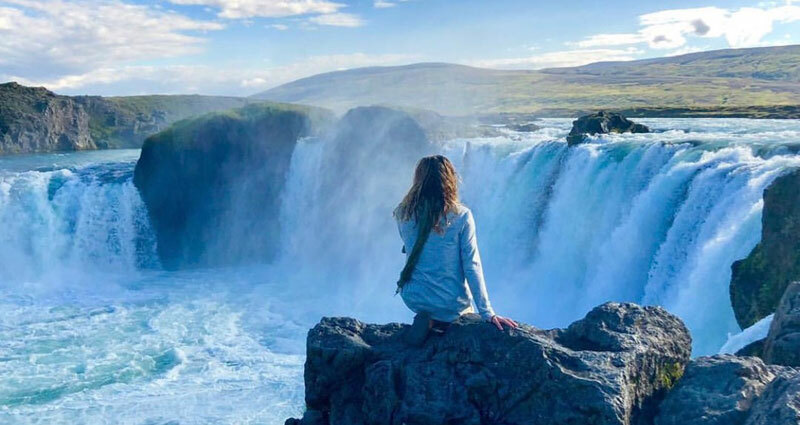 Iceland is a country of stark and beautiful landscapes and the opportunity to complete diverse walks with knowledgeable guides was a memorable immersive experience. This is the first time we have done a fully guided tour and we enjoyed the companionship of our small group of likeminded Australians. Best of all Gabriella's passion for travel was inspiring. 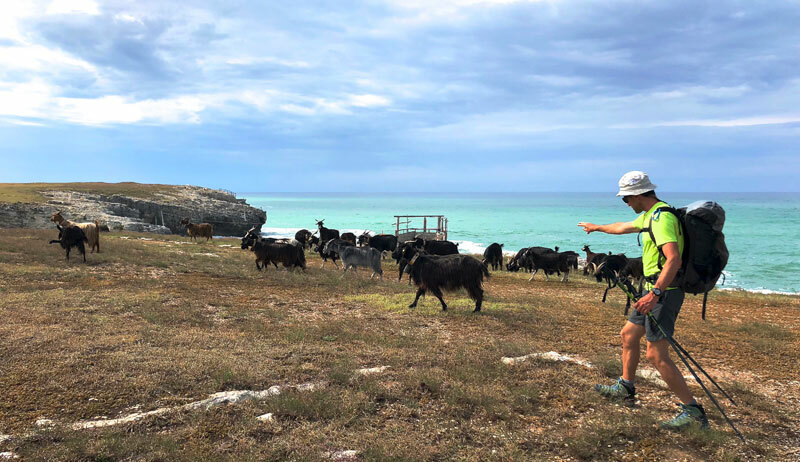 With the assistance of Callum, the various weather, injury and dietary challenges were met with a can-do attitude and enthusiasm ensuring we all had a fantastic experience." 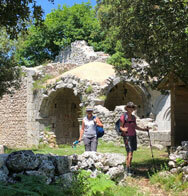 Gabriela and Francesco had perfect weather conditions on the Italian Lakes walk and enjoyed a wonderful group. Similarly Gabriela and Gilles had lots of fun on the Romantic Path walk through Austria and the Dolomites with a great group of walkers. 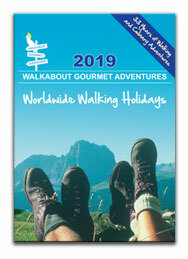 Graeme and Pascal have just completed the Taste of Europe walk through the Champagne and the Alsace regions in France as well as the Black Forest in Germany they are now half way through their Eastern Circuit Walk enjoing outstanding Autumn weather. Meanwhile Helmut and Nina were busy taking our guests through the Piedmont, Cinque Terre, Tuscany and Lazio in Italy. The Italian Lakes was our first experience with Walkabout, but it won't be our last. It certainly exceeded our expectations. 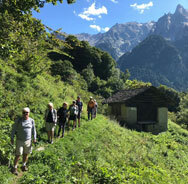 The walks, although challenging, rewarded us with magnificent scenery and experience of the real Italian countryside - vineyards, orchards and fascinating villages. Our best memories are of the picnic lunches in remote but beautiful surroundings, the alpine and glacial views in Switzerland, and of course the many village "bars" where we had a well earned drink at the end of a hard day's walk. The sense of achievement and the memories of the places we saw will never fade. 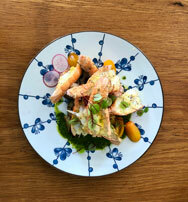 The food was superb, especially at the Old Station Restaurant at Intragna. 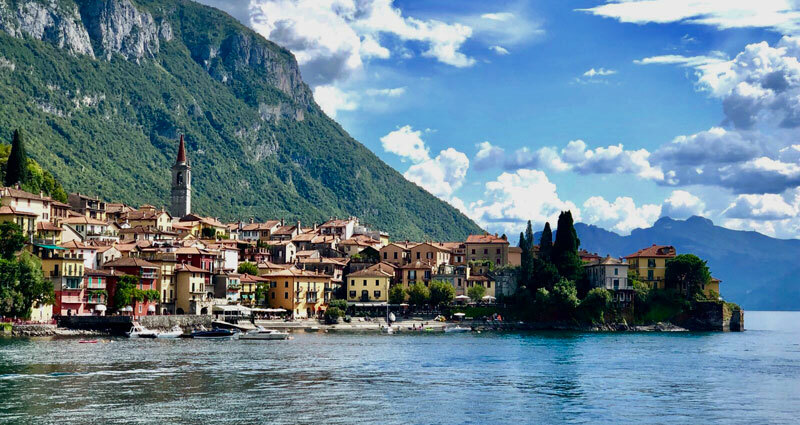 The accommodation was very good and chosen to give us a sense of the area we were in, especially the views of Lake Como and Lake Garda. The 8 seater vans were very comfortable. 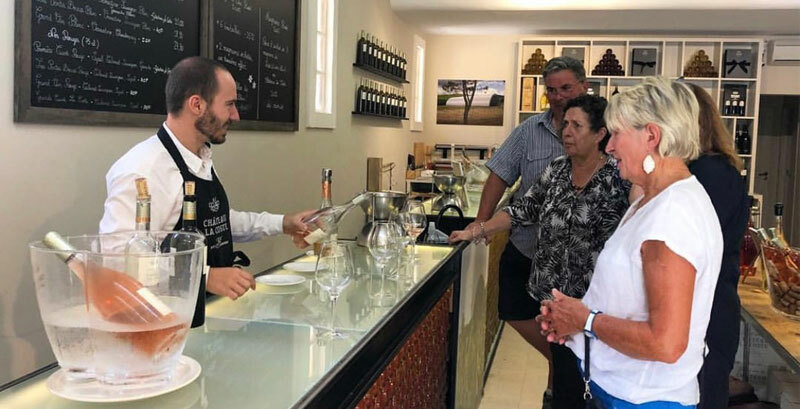 Our guides, Gabriela and Francesco were inspirational - nothing was too much trouble and they helped individuals where necessary while still being attentive to the whole group. Without them I would have not enjoyed and completed the challenge each day. I am so glad I did and will attack the next experience with confidence. 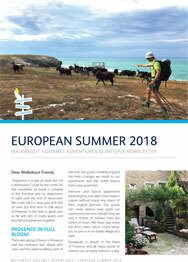 We have had many holidays in many countries and this one rates the highest"
We are working on a better time frame this year and are happy to announce that our brochure is just about ready to be printed. We were able to maintain most of this year's prices for next year, with only a few exceptions. You can preview (15 pages) and order the brochure if you haven't shared your postal address with us before. 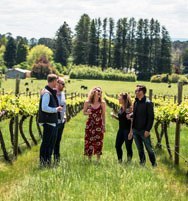 While you are waiting for the hard copy, please visit our online calendar - all the dates and tours are already there! 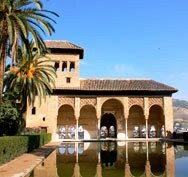 The Moorish Trail will no longer feature in our next brochure but instead we have decided to split the tour into an 11-day Journey through Andalusia tour and into an 11-day Mystical Morocco tour. This latter tour begins and ends in Marrakech and we will in the future have a local driver and a local bus. 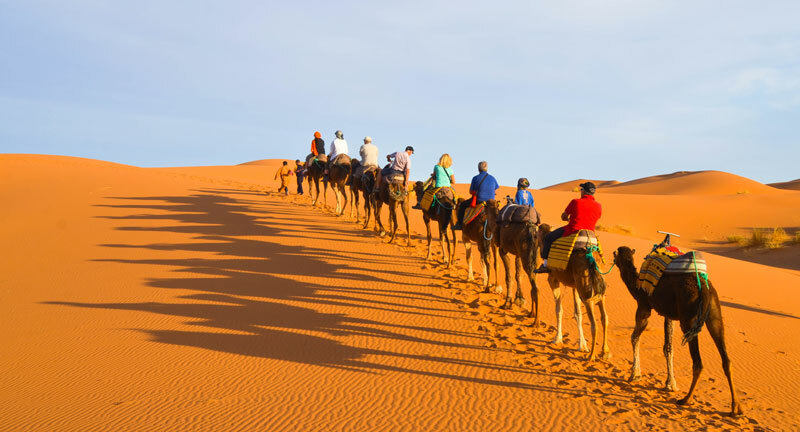 We will then spend two days in Dades before moving on to Merzouga and the Erg Chebbi desert. The Kasbah Azul in Agdz and the Domaine La Rosaire are certainly two of our favourite hotels in Morocco and the perfect locations for our spa and yoga retreats during the last 6 days of this tour. 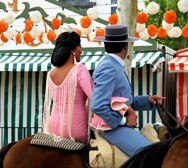 It is still possible to combine both tours into a wonderful 22-day Andalusia and Moroccan experience. I really enjoyed the 10 days in Andalusia with our tour guides Gabriela & Gilles. 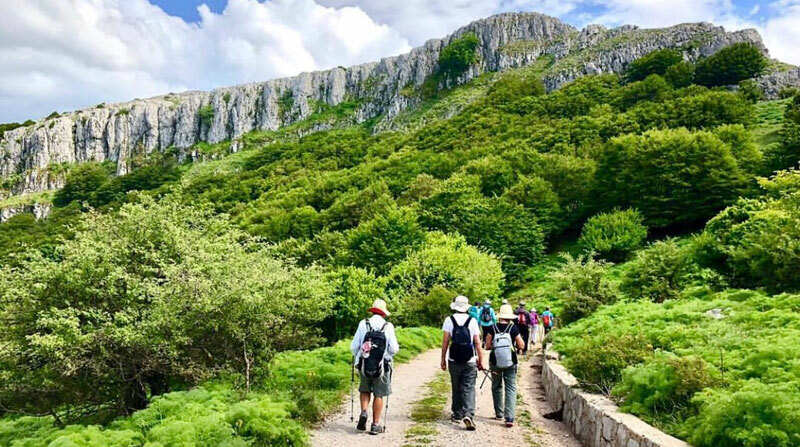 The walking trails through the Sierra Nevada & Grazalema natural park offered spectacular scenery. Our accommodation was varied & comfortable. I loved all the places we visited from San Jose to Seville. The meals were fine in the hotels but would have liked more tastings of Tapas. Morocco was a unique experience. Starting in Fes, staying at the Riad & a tour of the Medina was quite amazing. Then driving many miles across the High Atlas to the Dades Gorge on to the sand dunes at Erg Chebbi. Then back towards Marrakech via Agdz. Here we stayed at a very special Riad my favourite for the trip. The walks we did through the Berber villages was stepping back in time but all very interesting with local guides. It was unfortunate Gabriella had to leave us in Morocco but with Gilles there to guide us all the way we had a great trip." If you haven't had a chance to do it yet, please tell us your thoughts, memories of little details that made your day and your personal highlights by signing our guestbook so we can continually improve our services for you. Autumn is now just around the corner, so we are signing off with our best wishes from our "gypsetter" lifestyle and hope to see you soon on one of our walks somewhere in this world! PS: Remember that you can follow us on Facebook and Instagram.